Bathroom Storage Units - Bathroom Storage Solutions For Any Bathroom, No Matter How Small! Are your bathroom cabinets a mess? 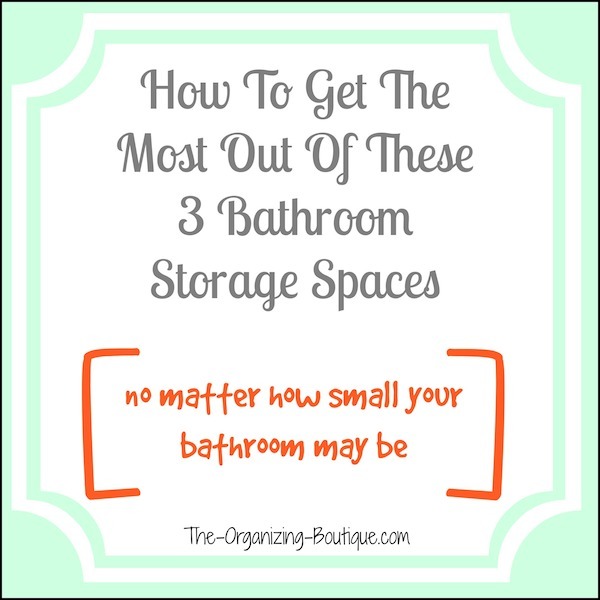 Use these simple tips for bathroom storage units to control the chaos. Bathroom organizers are essential for employing all of the storage space bathrooms have to offer...no matter how awkwardly-shaped! Take advantage of every nook and cranny in your bathroom cabinets with the following tips. 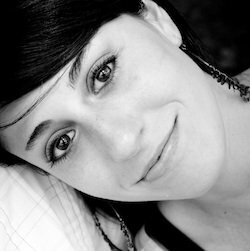 Below you'll find advice on how to organize bathroom cabinets - each kind of bathroom cabinet (medicine, above-toilet, under-sink) - as well as photos so you can visualize what I'm talking about. Happy Reading! Before we dive into getting your bathroom cabinets organized and talking about bathroom storage solutions, it's important that you get rid of the items you don't need first. It's much easier to get organized when you only have the things you want to keep in front of you (as opposed to a pile of items you want mixed with ones that can be thrown out or given away). Here's the bathroom organizing process broken down into easy-to-follow steps. Do this and then come back here for specific bathroom storage ideas on cabinets. Now that you've purged all the items you don't want or need and have sorted what you're keeping into categories that make sense to you (i.e. makeup, hair, skin), it's time to get the bathroom cabinets in order. The medicine cabinet I'm referring to here is the small bathroom storage cabinet in the wall that is usually behind a mirror. This cupboard tends to be shallow yet very accessible, so utilize this space to store the items you use on a daily basis or the most frequently. For example, I use my medicine cabinet to hold ONE of each of the following items: deodorant, face moisturizer, makeup remover, perfume, skin lotion, under-eye cream. To use all of the space inside the medicine cabinet, be sure to adjust the little shelves so that you can organize the items by size. 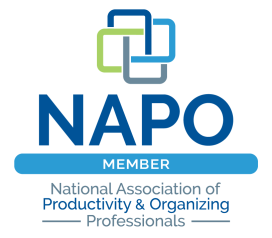 You may also want to consider using MagnaPods (little magnetic bathroom organizers) to utilize even more of the space. This product is made for holding nail polish, but it can also store other small bathroom necessities. This is usually an inexpensive piece of furniture purchased from a home goods store like the one below. These tall bathroom cabinets create more storage space above your toilet. 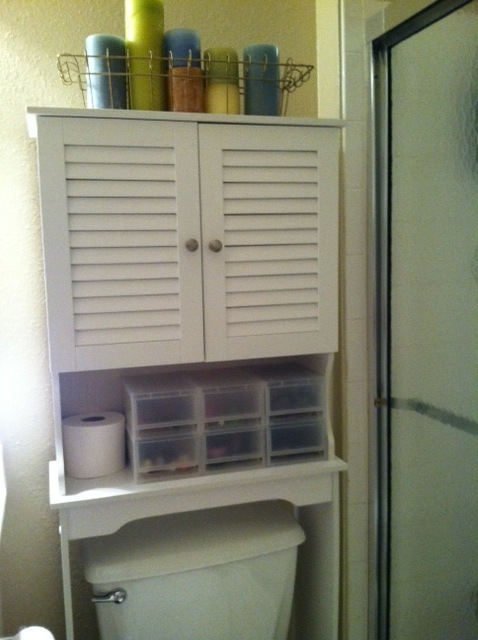 This is the second most accessible cabinet in the bathroom, so populate it with items that you use on a semi-frequent basis. For example, I keep the following in the cabinet above my toilet: prescriptions I do not take daily, hair products (bottles that need to stand up), nail polish & manicure items, and my husband's shaving supplies. Usually these above-toilet bathroom storage cabinets have one shelf inside and that's it. 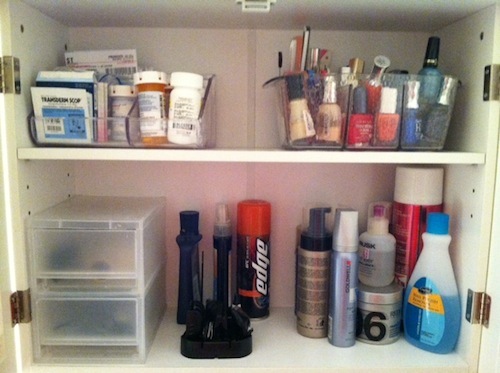 Utilize all of this space by breaking it up with organizing products (see below photos). This is my above-toilet cabinet. As you can see, I use bathroom organizers to break up and use all of the space. On the top shelf, I use a clear plastic organizer to hold my prescriptions and one to store my nail polish. On the bottom shelf, I use translucent stacking drawers to hold my husband's shaving items and the rest of the space is for my hair and nail products that need to stand up. This is what my above-toilet cabinet looks like when the doors are closed. I used the top for decorating the bathroom with candles. Since I don't have much counter space, I utilized the open shelf to hold small translucent drawers that store my makeup and small hair accessories as well as an extra (and very handy) roll of toilet paper. This space usually has the most real estate but is also generally the most inaccessible. You have to bend down to get things out and little items get lost very easily in this awkwardly-shaped cabinet. Use the cabinet under the bathroom sink to store the items you don't need regularly, and take advantage of all the space by using bathroom organizers to divide it up. For example, I utilize plastic stacking drawers to benefit from all of the vertical space. Each drawer holds a different category of back up bathroom items. The top drawer stores extra oral accessories like toothpaste, the second drawer holds extra shaving items like razors, the third drawer is for extra makeup and skin stuff and so on. 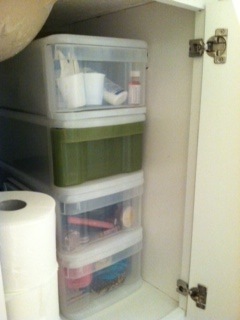 On the other side are more plastic stacking drawers for first aid things, feminine items, etc. You may also want to consider bathroom storage units or organizing products made specifically to accommodate the piping in this awkward space. Want to keep going? Here's detailed instructions for organizing nail polish, makeup organization and the whole bathroom.